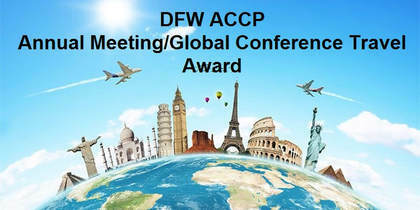 This award was created by the DFW chapter of ACCP in an effort to support our membership and participation in the ACCP Global Conference/Annual Meeting. Funds awarded may be used to financially support the member’s lodging, registration, or other travel expenses. Applicants will be evaluated based on 1) local and national ACCP chapter membership, committee work, and/or leadership; 2) intended presentations and/or professional service at the ACCP Global Conference; and 3) demonstration of financial need for conference attendance. One travel award will be given annually, and proof of ACCP Global Conference registration is required. If awarded, the recipient will not be eligible for this travel grant in the future. Check back for the 2019 application!